Most Golden South Sea pearls are harvested in Indonesia and the Philippines. Only a few of them are brought from Australia. Pearls of this color are exceptionally rare, which makes them luxury items of the highest class. It takes almost two years for the Golden-Lipped oyster (Pinctada Maxima) to produce golden South Sea pearls. Golden South Sea pearls are as large as 15mm, which provides them with an exceptional value on the jewellery market. The unique color of these pearls is entirely natural, which increases their value to the luxury level. Round golden South Sea pearls are the rarest pearls in the entire series. As such, these gems are considered to be outstandingly valuable. These pearls have a particularly warm luster, which is unpaired in the Pearl series. They are the embodiment of sophistication and luxury. 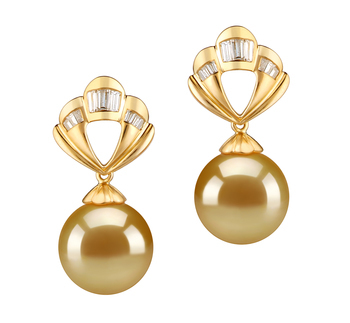 Golden South Sea pearl earrings are the definition of elegance and opulence. Their large size and lush colors make these earrings the perfect candidates for formal attire. Our guidelines will help you choose the perfect pair. 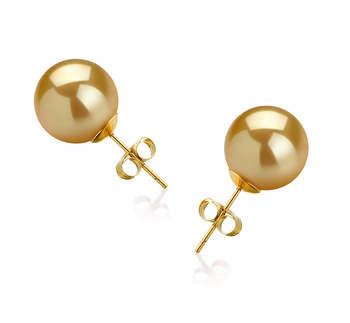 Golden South Sea pearl earrings will flatter your complexion regardless of your attire. However, you will feel more comfortable if you choose the right type to suit your style. Delicate and feminine, a pair of Golden South Sea pearl stud earrings will enhance your natural beauty. Their medium to large size makes them appropriate for daytime wear and semi-formal outfits. Pearl studs are easy to wear and can be paired with matching pearl jewellery or other gold-toned accessories. More sophisticated than studs, Golden South Sea drop earrings should be reserved for truly special occasions. The perfect jewellery item for parties, weddings, and formal events, this type of earrings will draw attention to the wearer’s face and will beautifully complement minimalist gowns. 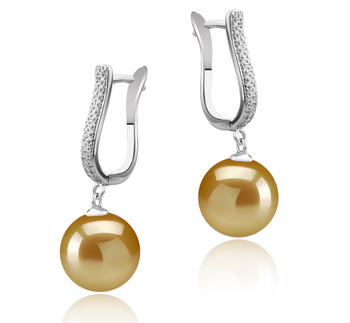 Pair these earrings with matching Golden South Sea pearl jewellery for a truly striking effect. Consider your style when deciding what earrings to purchase. If you gravitate towards semi-formal attire, you won’t go wrong with a pair of Golden South Sea stud earrings. These will beautifully polish off pantsuits and formal dresses to make you look sophisticated at business meetings. The best choice for formal outfits is the drop style earring. Pair it with a sleek updo and they will brighten up your complexion in an instant. 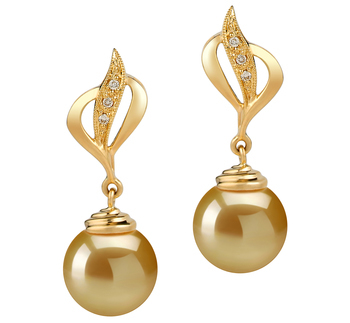 Golden South Sea drop pearl earrings look stunning with strapless or backless dresses.